It’s that time of year again and everyone is working on their back to school checklist. Although I am well into my thirties, (or at least halfway), and not yet a mom, I decided to go ahead and take that checklist literally. Checked, or gingham pattern is all the rage right now, predominnantly on skirts, and tops. 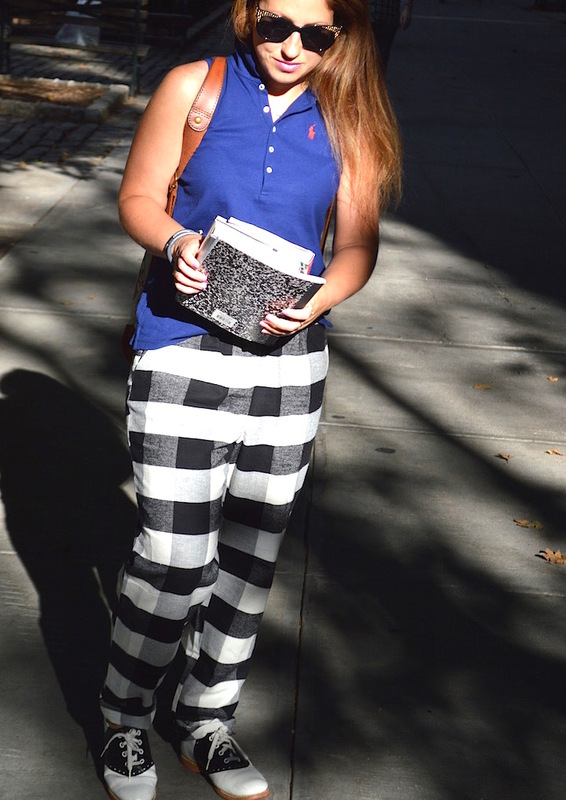 But when I found these checkered pants from ASOS were on sale for $20, it seemed like the fates of the back to school fashion gods had shined down on me. Pair with a navy polo, and old school saddle shoes, and you’ve got the perfect recipe for back to school success. Grades and motivation not included. Back to School outfit? Check! Pants, Asos. Ralph Lauren polo. Saddles shoes, vintage. Backpack, LuckyBrand. Wrap bracelet, JLO by Endless Jewelry.